In my last blog post I noted that effective September 1, 2017 a number of Court Rules directly impacting upon Family Part practice had been approved by our Supreme Court. I summarized and discussed a number of those Amendments. In this blog post , I will summarize and discuss two of the most significant and substantive new Rules which were adopted in this current cycle. Probably the most significant of the new Rule changes was the adoption of Rule 5:6-9. This Rule was intended to incorporate the terms of the newly enacted statute, N.J.S.A. 2A:17-56.67 et seq. which went into effect in February 2017. Commonly referred to as the “emancipation” statute, its focus was actually the modification of current law relating to the duration and termination of child support obligations. In addition to reiterating in large measure the wording of the statute, this Rule addresses in detail and at length the procedural and/or implementation aspects of same. Under this law, the obligation to pay child support would terminate by “operation of law” and without order by the court on a date that a child marries , dies , enters the military service, or reaches 19 years of age, unless (1) another age for the termination of child support is specified in a court order, but no event beyond the date the child reaches 23 years of age, or (2) upon written request seeking the continuation of child support beyond the age of 19 for a child (a) who is still enrolled in high school or other secondary education program, (b) was a student in a post – secondary educational program and enrolled for what the school considers to be full – time attendance during part of at least (5) calendar months of the year, or (c)has a physical or mental disability as determined by the federal or state governmental agency existing prior to the child reaching age 19 and requiring continued child support. Absent this, a parent could only seek to extend child support beyond the age of 19 by motion (due to exceptional circumstances as may be approved by the court). 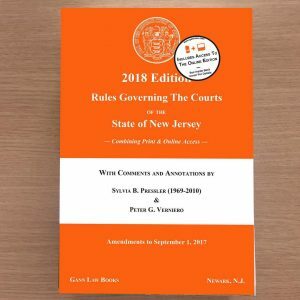 However, the statute also provides that it was not intended to prevent a child who is beyond 23 years of age or his/her parent from seeking a court order requiring the payment of other forms of financial maintenance or reimbursement from a parent as authorized by law to the extent same was not payable or enforceable “child support” as defined in N.J.S.A. 2A:17-56.52 or prevent the court upon application due to exceptional circumstance, including but not limited to a mental or physical disability, from converting a child support obligation to another form of financial maintenance for a child who had reached the age of 23. Rule 5:6-9(a) summarized the statutory language defining when an obligation to pay child support was terminated by “operation of law,”as referenced above. Rule 5:6-9(b) addresses the handling of termination of child support obligations in cases administered by the Probation Division. Where no other emancipation date or termination has been ordered by the court , this Rule directs Probation to send to the obligor and obligee notice of proposed termination of child support prior to the child reaching 19 years of age, which notice must contain the proposed termination date and information for the obligee to submit a written request for continuation of support beyond age 19. Curiously, while the statute references Probation providing at least two (2) such notices, one at least 180 days prior to the proposed termination date and another at least 90 days prior thereto, this Rule only refers to one such notice. The Rule goes on to provide that if no response is received to this notice by Probation, the court is to issue an order establishing the termination of child support as of the child’s 19th birthday. However, if in response to this notice an obligee submits within a time frame and form promulgated by the Administrative Office of the Courts a written request with supporting documentation along with a proposed future termination date, seeking the continuation of support beyond the child’s 19th birthday, including for the reasons noted above, this Rule directs Probation to review same and make a recommendation to the court as to whether child support should continue , and if sufficient proof is deemed provided for the court’s issuance of an order establishing a future termination date. The Rule provides that if either party disagrees with a termination or continuation order entered, that party may file a motion or application with the court to address same. It should be noted that this Rule does not specify what the nature of, or in which form that motion must be, i.e. namely since an order had already been entered, whether it needs to be in the form of a motion for reconsideration under Rule 4:49-2 and/or a motion to set aside or relief from an order pursuant to Rule 4:50-1, or simply a motion requesting a termination and/or continuation of child support. Would the nature or form of this motion matter if a written request in response to the probation department’s notice of proposed termination had been submitted or not? The Rule also provides for the probation department to send the obligor and obligee a notice of termination child support in advance of an emancipation date or termination date (presumably different than age 19) as may have been ordered by the court. Curiously, this Rule is silent as whether an obligee would also be permitted to submit a written response for any further continuation of child support; neither does it address whether a party did or did not have the ability to file a motion or application challenging any termination order entered as a result. Rule 5:6-9 (c) and (d) deal with child support obligations which are not administered by Probation, and provides a child support obligation shall terminate by operation of law in accordance with N.J.S.A. 2A:17-56.67 et seq. unless otherwise provided in a court order or a judgment, except that a party may file a motion or application requesting termination or continuation of child support at any time for good cause. Curiously , while referred to by many as the “emancipation” statute, N.J.S.A. 2A:17-56.67 does not use the term emancipation once, referring instead to the termination of child support obligations. However, Rule 5:6-9 (e) specifically addresses this issue. That Rule provides that except as otherwise provided by these rules, and in accordance with N.J.S.A. 2A:34-23, N.JS.A. 2A:17-56.67 et seq., and related case law, a party to a child support order at any time may file a motion in a dissolution matter or an application in a non – dissolution or domestic violence matter requesting the emancipation of a child. In such instances, a court ordered emancipation would terminate the obligation of an obligor to pay current child support as of the effective date set forth in the order of emancipation, although any arrears accrued prior to the date of emancipation would continue to be due and enforceable by the obligee or probation. Simply stated, while a child’s emancipation may result in termination of a child support obligation, neither the statute, nor its corresponding Rule, were intended to overturn or negate the law of what would constitute emancipation or a parties’ Agreement or prior court order defining or establishing same. Again, the primary focus of this statute and the corresponding rule, Rule 5:6-9, was to provide clarity as well as the mechanism to allow for the termination of child support obligations “by operation of law,” come to prevent child support orders and/or their enforcement from continuing ad infinitum in the absence of court or party action. Perhaps of equal, if not greater, significance , and as mentioned earlier, N.J.S.A. 2A:17-56.67 includes reference to and/or the creation of “financial maintenance” for children beyond 23 years of age. Rule 5:6-9(g) largely mirrors the language of the statute, providing that a child beyond 23 of age may apply to the court for an order requiring the payment of financial maintenance or reimbursement from a parent, as well as providing that a parent or a child over the age of 23 may apply to the court for an order converting a child support obligation to another form of financial maintenance in exceptional circumstances, including but not limited to the child’s physical or mental disability that existed prior to the date that the child reached the age of 23. While any arrearage which may have accrued prior to the date of termination or conversion would remain due and enforceable by the obligee or probation, the Court Rule makes clear that any court ordered “financial maintenance” or reimbursement from a parent shall not be payable or enforceable as child support, and that Probation is not required to provide for any establishment, monitoring or enforcement of such financial maintenance or reimbursement order. As noted in my prior blog post, such financial maintenance orders would now be considered enforceable under Rule 5:3-7 and Rule 1:10-3. Finally, although contained as a sub section of Rule 5:6-9 (b) dealing with Probation cases, Rule 5:6-9(b) (8) and (9) address the impact of termination orders upon child support obligations for other children, depending upon whether the underlying child support obligation had been allocated or unallocated, and the ability of either party to file a motion or application to seek an adjustment of same, largely reiterating the statutory language of N.J.S.A. 2A:17-56.68. Perhaps not having the wide reach and general application of Rule.5:6-9, another entirely new Rule was adopted by the Supreme Court in response to a recently enacted statute. Rule 5:7B was adopted establishing procedures for obtaining temporary and final protective orders under the Sexual Assault Survivor Protection Act, N.J.S.A. 2C:14-13 et seq. Enacted in 2015 to be effective in May of 2016, this statute was designed to afford victims of various enumerated sexual offenses, including non-consensual sexual contact, sexual penetration, or lewdness, or any attempt of such conduct, who were not eligible for restraining orders as a victim of domestic violence as defined in that Act (i.e., absence of a required relationship-family type, dating etc.) an ability to file an application for a protective order (as distinguished from a restraining order), and regardless of whether criminal charges based upon the incident were filed, and regardless of the disposition of such charges. It is noteworthy that the Sexual Assault Survivor Protection Act largely mirrors much of the language contained in the Prevention of Domestic Violence Act, including the opportunities to seek final temporary and/or final protective orders, the administrative and court procedures for obtaining same, and the nature of the relief available to victims. It should be noted that the enactment of this statute was motivated in large measure, but not exclusively, to the prevalence of sexual offenses occurring on college campuses. The provisions of Rule 5:7B are similar to those contained in Rule 5:7A concerning Domestic Violence proceedings, summarizing the standards and procedures to be applied in such actions, although in each instance, the Acts themselves should still be looked to as detailing the rights, remedies and underlying process itself. In my next blog post I will conclude my summary and discussion of the current Family Part Rule Amendments, including those of more general application .